I want to be like the dog in the Andrex advert! How on earth am I suppose to wipe my bum, if they put the roll out of reach!!!! If a flippin' Labrador can do it then so can I! Is it soft, strong and very very long ????? For god's sake why can't people change the loo roll when it runs out? it's always down to me! The bed is now mine ! The couch is now mine ! I have seen the videos on YouTube. 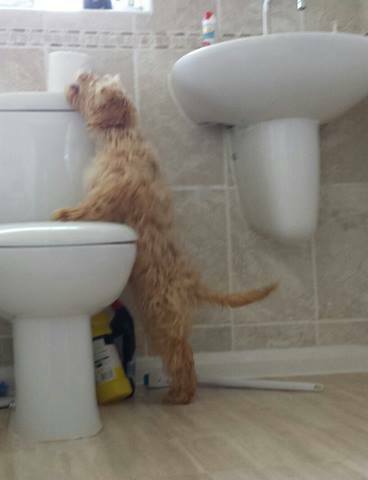 How hard can it be to use the toilet? "Sausage roll, great. Swiss roll, yummy. Toilet roll, worth a go." What's that marshmallow doing up there?! "I'll keep smiling but, I wish those dogs would pay attention when I'm on the television." Ok as soon as they pull off the drive we will raid the laundry basket and the sock draws. 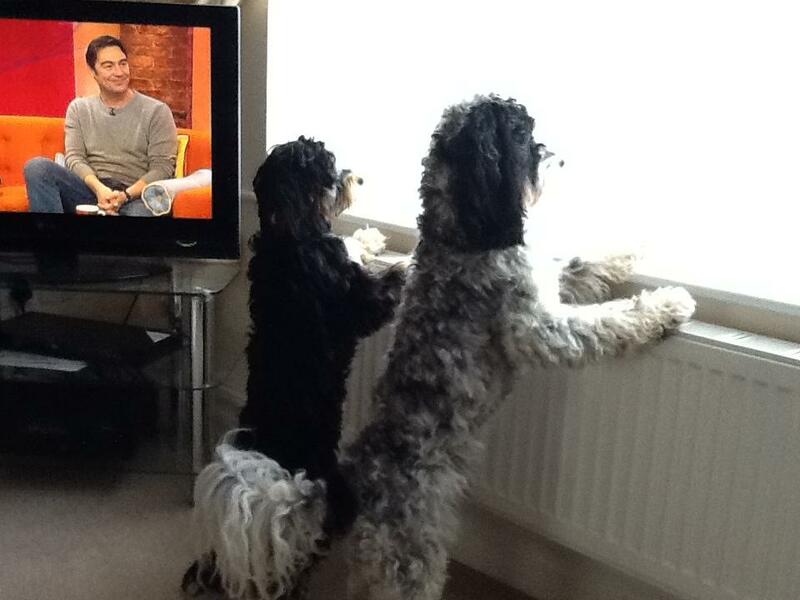 "I wonder what that guy on the telly has seen out the window"
"what time did Mum say the post man was coming?" "wonder if he'll bring our equafleece jumpers so we can go for those lovely long walks and not get so muddy" "that will please Mum"
"I've got my angora hoola hoola skirt on again, do you think she will notice?" "What is that man looking at?" "I don't see anything but my paws are nice and toasty here so let's keep it up til we see the postman"
We've been stuck here for hours, we really should listen when told not to play with mums superglue. Why do humans watch that box all day when there's so much more going on outside? "I think No 43 needs the 60 minute makeover team - have you seen those curtains? Tutu wearing Ruby " Look you should have put your ballet tights on Jasper, whilst doing our barre exercises, see I told you no-one would be looking...."
Someone said Father Christmas is on his way very soon .........but we can't see him !!!! "You would think her from No 4 would look in the mirror before she came out". "I don't fancy yours much !" "Look mother, it's not raining, just get your coat on and let's go!! " Ruby and Jasper took their role in neighbourhood watch scheme very seriously! That's not a very impressive Christmas decoration ! "Dare I ring for the maid again already?" "This sort of thing is going to ruin the art of barking." "Mum, Seriously ?? I'm all for recycling..... But don't you think you've taken it too far this time ??" "If I have to jump up to ring them, I'm going to wet myself"
You can ring my bellellell, ring my bell, my bell, ring my bell . Bah humbug! It's only November 13th! And the other end has got knobs on ! Mmm? Jingle Bells another sign that Christmas is on its way. Sigh..... I had a pair of those once..
"Oooh those be Poochie Bells, they really are quite swell, for a poochie Poo like me, so I can tell the world, if I need to poo or pee!" "I've sat here all day, but nobody rings".. If I can only get them down......I could do a wicked Hamster impression !!" So that's where me balls went! 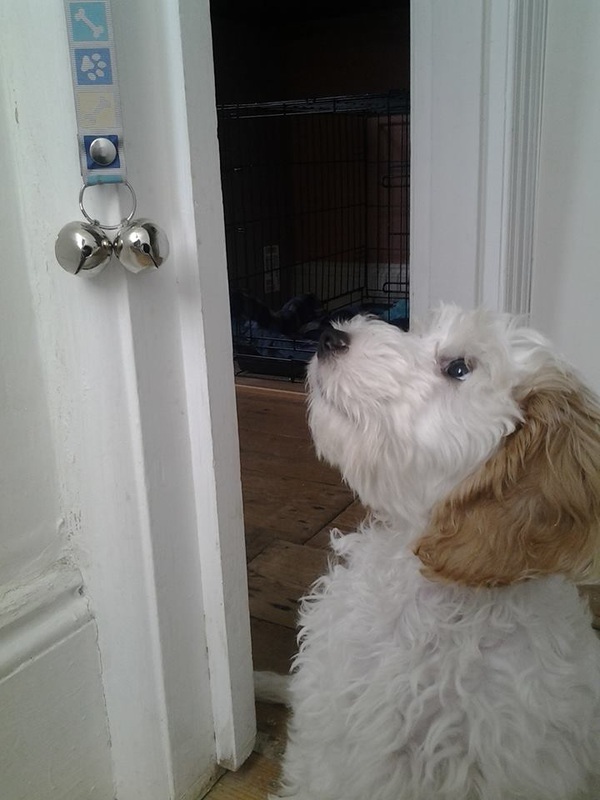 "Every time a Bell rings, a cockapoo gets lots of things"
"So let me get this right - I pee on the kitchen floor, then ring the bell?"